Prompt action by railroad employees was credited today with saving more than $1,000,000 in rolling stock as a two-alarm fire gutted the Katy roundhouse. Employees drove two locomotives and several rail cars from the sheet iron building after a steam generator exploded, hurling burning oil on the walls. The Milwaukee Brewers take over the local Texas League baseball franchise and change the name from the San Antonio Missions to the San Antonio Brewers. They have also signed a lease with V. J. Keefe field, which the Texas Leaguers have used since Mission Stadium was abandoned. City councilman Henry Cisneros, 29, is sworn in as mayor pro-tempore. He is the youngest mayor in the city’s history. The Olmos Dam is dedicated and opened to traffic. 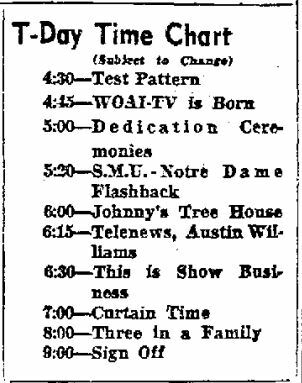 WOAI-TV Channel 4 was dedicated today (right). The station began broadcasting regular programming at 4:45 that afternoon and signed off at 9:00 pm. The feature program is the SMU-Notre Dame game from Dec. 3. The program was condensed to 40 minutes by eliminating huddles and time between plays. A 13-year-old Tanya Tucker performs in Municipal Auditorium with Connie Smith as part of the Toys for Tots Show sponsored by KITY radio and the U.S. Marine Corps. Colonies North Shopping Center opens for business at Wurzbach and Ironside Drive. Stores include: Handy Andy, Winn’s, Michael’s (clothing), Treasure Cove, Cheer Shop liquor store, M&M Hardware and Colony Furniture Mart. 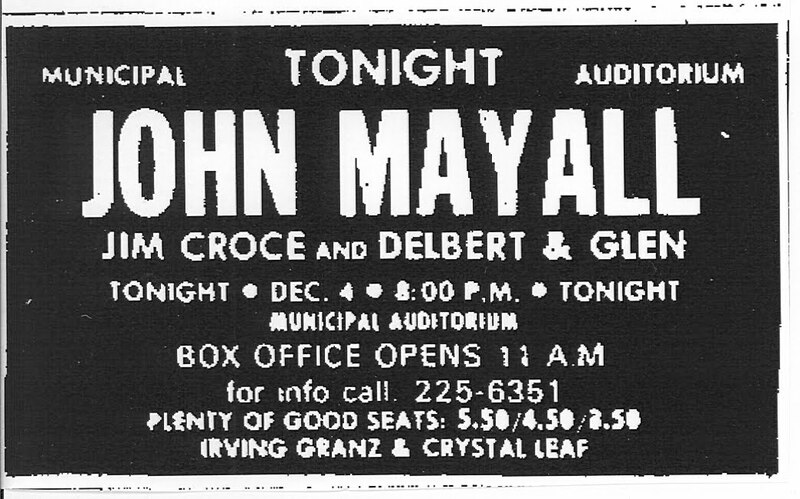 John Mayall headlines a concert at the Municipal Auditorium with opening acts Delbert [McClinton] & Glen [Clark] and Jim Croce. This is Jim Croce’s only appearance in San Antonio. U.S. Rep Henry B. Gonzales punches a patron at Earl Abel’s for calling him a communist. 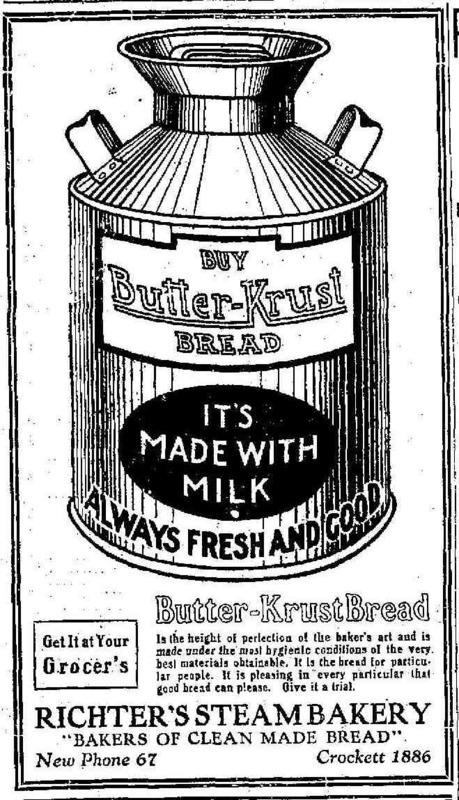 Albert Friedrich places this advertisement in the San Antonio newspapers offering his horn and curio collection for sale. Randolph Field is dedicated in front of 20,000 San Antonians and visitors. Brig. Gen. Frank P. Lahm, commander of the Air Corps Training Center, called it “the best site I have ever seen for a flying field.” Texas Governor Dan Moody was forced to scramble from his car when it caught fire leaving the event but the auto was quickly extinguished by nearby firemen. The Eagles make their first appearance in San Antonio, opening for Jethro Tull at Convention Center Arena. J. M. Cook, a civilian, employed as a pumper at station No. 3, Camp Stanley, was shot in the left side of the face at 11 o’clock last night by an unidentified person who fired a revolver through a knothole in the pumphouse. An automobile was seen to leave the vicinity of the pumphouse at high speed immediately after the shot was fired. The bullet lodged in Mr. Cook’s jaw. Final plans and specifications for initial buildings, site development and utility distribution system at the new University of Texas at San Antonio were approved by UT regents today. Plans cover seven buildings encompassing 7000,000 gross square feet of floor space at an estimated cost of $36,522,000. Solo Serve holds their final liquidation sale and closes after 80 years in business.